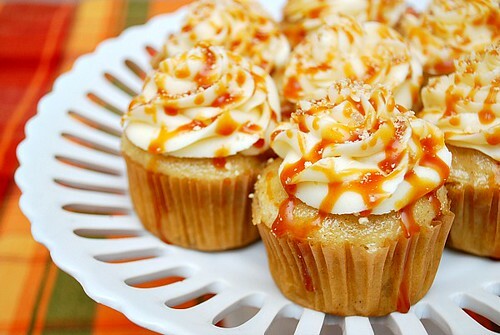 Caramel Apple Spice Cupcakes Should WIN! Did you hear about our Flavors of Fall Cooking Contest yet? Here is the lowdown: They are giving Chicagoland's best at-home cook the chance to demo their best fall-inspired dish live on WCIU You & Me This Morning. show. But there is a catch - contestants have to use a secret ingredient chosen specifically by the food experts at Artizone.com, the city's only artisanal food delivery service and MyDailyFindChicago.com, an online lifestyle magazine that specializes in "finding" the best of the city. During the month of October, potential contestants will pick a fall flavor theme that best highlights their expertise in the kitchen - soups and chilis, slow-cooked meals, and baked goods. Everyone has to incorporate the secret theme ingredient and upload a photo of your dish to the Facebook contest page. From there, it's a popularity contest! 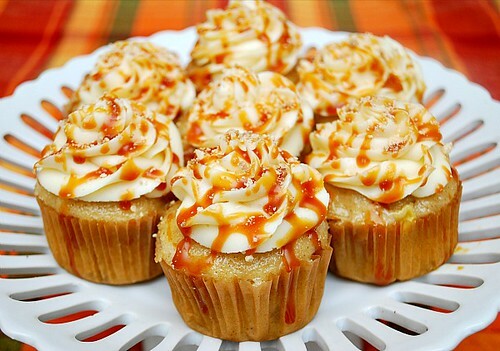 So if anything, could you please vote for my Caramel Apple Spice Cupcakes through Facebook?! I would greatly appreciate it and would love to represent Chicago with these! The THREE photos with the most votes move on to the "Flavors of Fall Showdown" Party on November 11 at Centered Chef Studios for a chance at the Grand Prize - $500 to Artizone.com, a farm-to-table dinner for six at City Provisions and a chance to demo the winning dish live on WCIU's You & Me This Morning show. A panel of fall food experts, including Jeanne Sparrow of WCIU, Cleetus Friedman of City Provisions, Amanda Skrip, chef and wellness consultant, Patty Erd of The Spice House, and Art Jackson of Pleasant House Bakery will judge the top three dishes for the Grand Prize Winner. Two runners-up will receive $250 credits to Artizone.com and all participants will walk away with a $25 credit to Artizone.com. The party is open to the public and tickets can be purchased through eventbrite. Food and drink are complimentary and kids are welcome. A portion of the proceeds from the Flavors of Fall Showdown Party will benefit the Lakeview Food Pantry.